The toy was always the gold standard, of course, because it gave such immediate gratification (even if it was a cheap piece of plastic that broke right away). I remember fighting my brother to the box, then shifting all of the cereal to one side so I could get to that plastic-bag-wrapped item at the bottom. But the other appealing option was the “four box top”/no money required offer. I cashed in on these offers occasionally, scoring more valuable items like a Cinnamon Toast Crunch bakers musical coin bank, a Snuggles stuffed bear, or $1.00 off coupons for my favorite candy bar. For a 10 year old with no income, box tops were my currency! Which brings me back to the Pringles promotion. Of course I loved it, because the only investment is to buy (and collect) receipts for four Pringles cans. They’ll even pay the shipping! But I also loved it because—c’mon!—they’re making a SPEAKER out of a Pringles can! How cool is that? I just want to see how that works. They’re claiming an activity probably developed by camp counselors or science teachers (making speakers out of Pringles cans) and branding it. They’re creating a new product from their existing packaging, ensuring their brand stays in front of customers longer. (As a bonus, the promotion has a favorable “re-use” angle to it). They’re trading a product (speakers) for valuable customer demographics (by requiring them to fill out an entry form). They’re offsetting the cost of the promotion somewhat by requiring multiple purchases, perhaps even converting customers from infrequent to frequent purchasers of their product. In short, they’re building brand loyalty. The speaker idea piques curiosity, converting more customers to take part in the promotion. 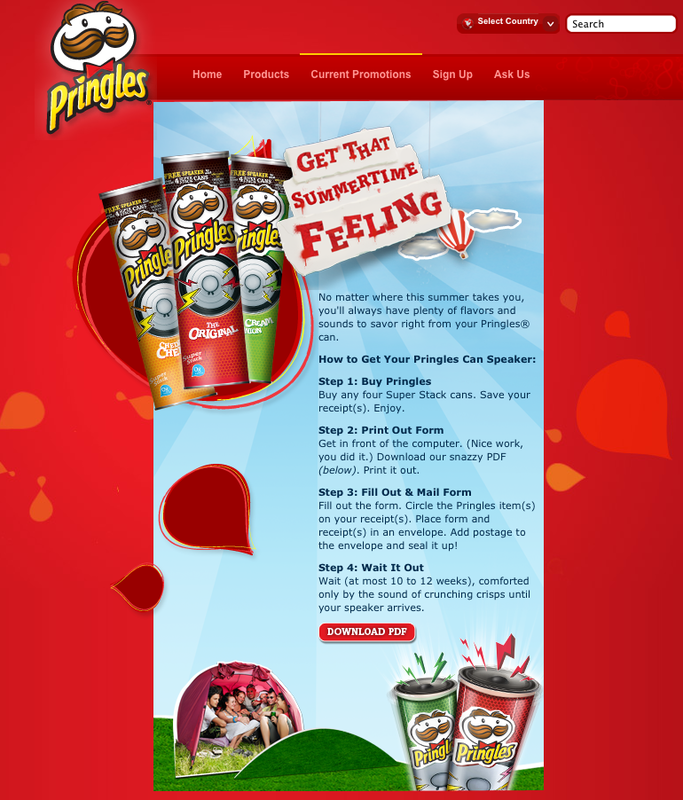 The fun idea has the potential to go viral, or at the very least spawn some online interactivity showing people playing with their new Pringles speakers. So now for the take home message: combine a clever give-away with a low purchase price, and you have the opportunity to build brand awareness and loyalty. Now excuse me while I go buy some Pringles. This entry was posted on Tuesday, June 21st, 2011 at 4:29 pm and is filed under Marketing your Business, Uncategorized. You can follow any responses to this entry through the RSS 2.0 feed. You can leave a response, or trackback from your own site.